The middle part of the conclusion to the first season of Justice League sees the heroes scattered across war-torn Europe in the 1940s, struggling to correct a timeline altered by Vandal Savage. Flash, Superman, and Hawkgirl are helping to evacuate Allied forces nearly overwhelmed by the unexpectedly superior future-technology of the Axis. Green Lantern, meanwhile has been left behind, his ring out of power, a warwheel playing a deadly game of cat-and-mouse with him. Even though Flash goes back for him, Green Lantern remains separated from his team, knocked into the muddy river where Flash can’t find him and he can’t hear his teammates calls. Clearly, we’ve got some enforcement of the “Split Into Teams” trope from last episode, whether by game system or Gamemaster fiat. Meanwhile, Superman and Hawkgirl have to fend off an attack by German air-forces at the beach. “This time all bets are off!” Superman says, with the clear implication that the heroes are no longer pulling their punches. Considering the number of planes smashed, incinerated, or literally cut in half by Superman’s heat vision (!) the Leaguer’s mean business. We even get an homage to the Golden Age of Timely (i.e. 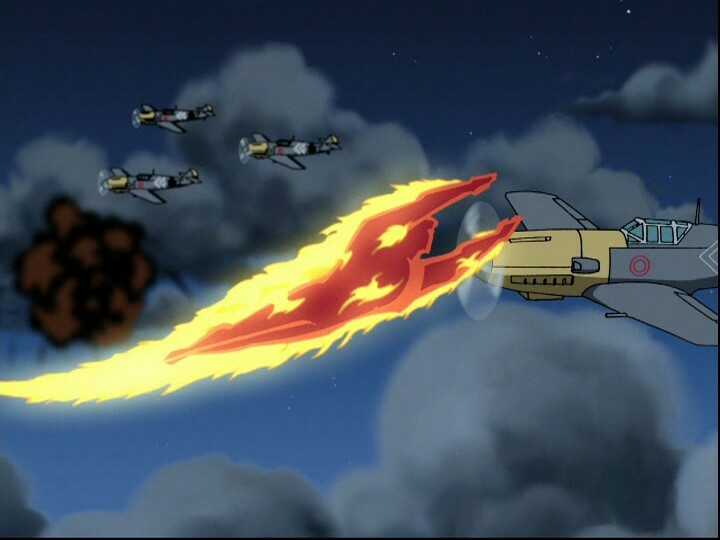 Marvel) Comics when Superman flies directly through a German plane, giving us a momentary “human torch” flying past. 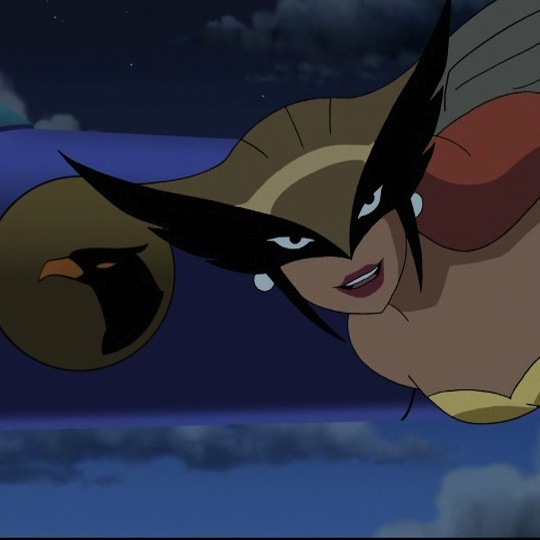 Note that Hawkgirl getting “winged” (no pun intended) by some machine gun fire seems to do no more than stun her, another example of the “invisible edge” trope: in spite of the deadly weapons and the seriousness of the combat, there’s no blood, no wounds, and no visible death, although it’s certainly implied. The timely arrival of the Blackhawks turns the tide and sends the German pilots packing. Meanwhile, Green Lantern meets up with Sgt. Rock and “Easy Company” and begins working with them behind enemy lines, without the use of his ring to back him up. Vandal Savage follows supervillain etiquette in explaining his scheme to the captive Martian Manhunter before allowing J’onn the opportunity to escape the ministrations of the torturer Yosef. Wonder Woman escorts Steve Trevor to his rendezvous, and a romantic subplot blossoms, but the meeting is a trap. The Nazis have captured the codebreaker Ernst, but they haven’t reckoned with the Amazon Princess. Although Trevor tries to gallantly draw them away, she ends up rescuing him in a display of bullets-and-braclets, and picking up and tossing jeeps. There’s an implication that Diana’s lasso helps to get information out of a captive (“I can be very persuasive,” she says) but we later learn that’s not the case, since the truth-telling power of the lasso is not active at this time (and won’t be until much later in the series). War Is Hell: Some RPGs (and settings) draw a stark line between lethal and non-lethal forms of combat or conflict, while others do not. Indeed, in some rules systems, it takes considerable effort not to kill opponents, and characters can sometimes do so accidentally (as happens in combat). For example, in a particular Champions game we played, a martial arts hero went all-out with a normal damage attack (albeit with a lot of dice), not even a Killing Attack, against a foe, only to discover the villain’s physical defenses were not that good and the BODY damage was enough to mortally injure her! Decisions about lethal vs. non-lethal damage, and the players’ control over that choice to use it, can influence the style and outcome of the game. It’s a significant enough part of this episode for Superman to specifically mention it, and “… all bets are off!” seems to have some real effect in terms of how the heroes fought, and how effective they were. Easter Eggs: A fun element of many intricate superhero settings is the opportunity to include “Easter eggs,” homages and references to setting lore, like the “Human Torch” moment, or the soldier amongst the casualties Hawkgirl shows Flash, who is bandaged up like DC’s “Unknown Soldier.” These can be fun parts of an RPG as well, so long as they don’t distract from the rest of the game. The Freedom City setting, for example, is loaded with sly winks at comic book history and lore. Gamemasters can even encourage players to come up with Easter eggs and homages by award bonus points (in-game or advancement) for including them. Not So Hot Without That Fancy Ring: Speaking of earning bonus points, John Stewart spends this episode doing so, playing out the loss of his power ring (set up at the start of the previous episode). In some games, this is the result of limitations placed on the ring and part of the “price of admission” for having such a device (example’s being the Hero System’s Focus limitation). In other games, this subplot is a means for Green Lantern to rack up other resources, such as hero points in Mutants & Masterminds, where Power Loss is a complication introduced by the player or GM, awarding points in-game. We’ll see some of the effects of that in the next episode, where Green Lantern “cashes-in” on some of those points. J’onn’s player simply says, “I want to escape, overpower the Colonel, and disguise myself as him to slip out of the room.” The GM agrees and, without any engagement with the rules system, it happens and the player simply roleplays the departure. This is just a matter of the GM deciding the action is effective and that it’s not worth the potential for it to fail. Alternately, the player proposes the same plan, but the GM requires either more detail (“Exactly how do you escape and overpower the Colonel without raising an alarm?”) or engages with the rules (“Okay, you can easily phase out of the restraints and that gives you a surprise attack against the Colonel, roll for it.”) This allows for the possibility of a random outcome, depending on how the dice fall, or how good the player’s plan is. The rules allow for a “meta-escape” of some kind. For example, Spirit of the Century has a stunt called “Master of Disguise” (most appropriate for a shapechanging Martian) that allows the player to take the character “out of play” while “off-camera” later dramatically revealing that an NPC is actually that character in disguise! In this instance, the GM would narrate the Colonel leaving the room, then the player jumps in and says, “I’m activating my Master of Disguise; the Colonel is actually J’onn. The real Colonel is still in the room!” In this approach, the GM and other players may be as surprised as the audience! There are other possibilities as well, but it’s interesting to note how the game system engages with the narrative of the story and how it doesn’t and how game system choices can affect the narrative decisions players make and how they make them.